Not to be confused with Lienz. Linz (/lɪnts/; German pronunciation: [ˈlɪnt͡s]; Czech: Linec) is the third-largest city of Austria and capital of the state of Upper Austria (German: Oberösterreich). It is in the north centre of Austria, approximately 30 kilometres (19 miles) south of the Czech border, on both sides of the River Danube. The population of the city is 204,846, and that of the Greater Linz conurbation is about 789,811. Approximately 29.27% of the city's 96 km2 (37 sq mi) wide area are grassland. Further 17.95% are covered with forest. All the rest areas fall on water (6.39%), traffic areas and land. One important inhabitant of the city was the age of discovery-era astronomer and mathematician Johannes Kepler, who spent several years of his life in the city teaching mathematics. He discovered, on 15 May 1618, the distance-cubed-over-time-squared — or 'third' — law of planetary motion. The local public university, Johannes Kepler University Linz, is named after him. Adolf Hitler was born in Braunau am Inn (Austrian town near the German border) and moved to Linz during his childhood. Hitler spent most of his youth in the Linz area, from 1898 until 1907, when he left for Vienna. The family lived first in the village of Leonding on the outskirts of town, and then on Humboldtstrasse in Linz. After elementary education in Leonding, Hitler was enrolled in the Realschule (secondary or high school), as was the philosopher Ludwig Wittgenstein. Notorious Holocaust architect Adolf Eichmann also spent his youth in Linz. Until the end of his life, Hitler considered Linz to be his hometown, and envisioned extensive architectural schemes for it – including a massive new Fuhrermuseum to house his collection of looted art – wanting it to become the main cultural centre of the Third Reich, and to eclipse Vienna, a city he hated. In order to make the city economically vibrant, Hitler initiated a major industrialization of Linz shortly before, and during, the Second World War. Near the end of World War II, Hitler became enamored of the musical compositions of Anton Bruckner, and, as a result, planned to convert the monastery of St. Florian in Linz – where Bruckner had played the organ, and where he was buried – into a repository of Bruckner's manuscripts. Hitler evicted the monks from the building and personally paid for the restoration of the organ and the institution of a Bruckner study center there. He also paid for the Haas collection of Bruckner's works to be published, and himself purchased material for the proposed library, Additionally, Hitler caused the founding of the Bruckner Symphony Orchestra, which began presenting concerts in Fall 1943. His plan for one of the bell towers in Linz to play a theme from Bruckner's Fourth Symphony never came to pass. In addition to an ordnance depot, Linz had a benzol (oil) plant which was bombed during the Oil Campaign on 16 October 1944. What was once the Mauthausen-Gusen concentration camp is 20 km (12 miles) east of the city of Linz. In 1996, the city council decided to account for its Nazi past. The widespread scientific work, which was implemented by the municipal archives, covered the period prior to 1938 as well as the denazification after 1945. Linz became the first city in Austria to deal intensively with its own Nazi past. In May 2001, seven scientific publications, online presentations, and numerous lectures were made public as a result of these efforts. The culture of remembrance extended to the construction of monuments for the victims of National Socialism. Especially since 1988, numerous memorials have been created in public spaces. The city's confrontation with its Nazi past resulted in the renaming of many streets. In 1945, immediately after the end of the Nazi dictatorship, 39 streets in Linz were renamed, whereas from 1946 to 1987, only two streets were renamed. However, since 1988, 17 new traffic areas were named after victims of National Socialism or resistance fighters. In the recent past a number of Nazi victims and activists who fought Nazism were honored by the city. Simon Wiesenthal, who founded the first Jewish Documentation Center in Linz in 1945, received an award for his work in remembrance of victims of the Second World War. In 1975, Linz upgraded the college founded in 1966 to become the country's highest form of academic institution, the Johannes Kepler University. It was established in a 90-acre (364,000 m²) park centered around a pond in the northeast of the city. The urban area includes (parts of) 13 other municipalities with together 271,000 inhabitants. 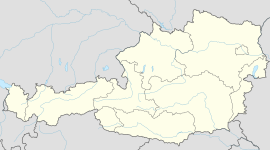 Linz is also part of the Linz-Wels-Steyr metropolitan area of Upper Austria, home to around one third of the state's population (460,000 people) and second-largest urban area in Austria. Linz has a total number of about 157,000 jobs. However, only half of vacant jobs can be covered by its inhabitants. This enormous job surplus causes a correspondingly high rate of commuters from the surrounding communities of Linz, resulting in enormous traffic problems. Linz has a oceanic climate (Köppen climate classification: Cfb) or, following the 0 °C isotherm, a humid continental climate (Dfb) with warm summers and quite cold winters. The hotel business is equipped with 4,544 beds – 2,302 are located in the ten four star hotels of the city. Nine hotels have three stars and count 1,226 beds. The seven two and one star hotels are equipped with 472 beds. 544 beds are not categorised for commercial businesses. Five star hotels are not available. In 2004 Linz counted 647,428 nights' stay. In 2013 the number increased to 775,396. 363,425 of the overnight stays were located in the four star hotels, 226,647 in the three star hotels, 67,593 in the two and one star hotels and 53,194 stays can be counted to other accommodation. Overnight stays in 5/4-star hotels increased by more than 5% from 20.590 to 21.655 between February 2017 and February 2018. During the same period, overnight stays in 3-star hotels increased by 22%, from 13.383 to 16.330. The number of overnight stays in non-categorized hotels dropped by almost 10%, from 4.177 to 3.763. 544 gastronomy businesses are located in the city. In 2017 Germans were the most frequent guests (165,851), followed by tourists from China, Hong Kong and Macao (26,161), making Italians 3rd in comparison with the years before – the ranking is equal to the overnight stays ranking which is listed in the following. The container terminal at the harbour. Linz is one of the main economic centres of Austria. Voestalpine is a large technology and capital goods group (founded as the "Hermann-Göring-Werke" during the Second World War), which is known for the LD- ("Linz-Donawitz") procedure for the production of steel. The former "Chemie Linz" chemical group has been split up into several companies. These companies have made Linz one of Austria's most important economic centres. Furthermore, due to the fact that one of the four Donau-Harbors (Donauhäfen) in Austria is located in Linz, it constitutes an attractive location in regards to logistic and trading enterprises. Nonetheless manufacturing plants can – for instance - be found at the waterfront as well. The economic importance of Linz was founded over centuries in trade. Moreover, the long-standing image of Linz as an industrial city was a result of the National Socialism. As a result of this large industrial enterprises are still located in Linz nowadays. Great examples in regards to this are Voestalpine AG or "Chemie Linz" – as already mentioned above. From an economical perspective they represent a large number of jobs and of course industry related enterprises. There are eleven farmer's markets as well as one weekly flea market and two Christmas markets in Linz. One of the most popular ones is the "Urfahraner Markt", which takes place in spring and fall every year. Visitors can enjoy a mix of leisure facilities, stalls and party tents. Furthermore, there are annually Christmas and New Year's Markets. The aim of the market administration is to provide the population with a wide range of products, as well as operating the markets in an economical, suitable and customer oriented manner. Additionally, the annual market called "Linzer Marktfrühling" sets further accents and lures new customers with attractive offers. The Pöstlingbergbahn, a part of the tram network. Linz Airport lies about 14 kilometres (8.7 mi) southwest of the town centre, in the municipality of Hörsching. The airport can be reached easily via federal highways B139 and B1. The bus line 601 connects the airport within 20 minutes with the centre of Linz. There is also a free shuttle service from Hörsching railway station. Direct flights include Frankfurt, Düsseldorf and Vienna with additional seasonal routes added during the summer and winter months, like for example Mallorca, Ibiza, Tenerife, several Greek islands (like Kos, Rhodes, Crete or Corfu) or Hurghada. Ryanair also flies to London Stansted Airport. The city also has a central railway station (German: Hauptbahnhof) on Austria's main rail axis, the West railway, linking Vienna with western Austria, Germany and Switzerland. The Linz central station has been awarded eight times (from 2005 to 2011 and 2014) by Austrian Traffic Club as the most beautiful train station in Austria. There are also varying types of river transport on the Danube, from industrial barges to tourist cruise ships. The National Police Directorate forms the security authority for the city. The city's police commands function as law enforcement agencies. In Linz, one of six Austrian professional fire brigades is located. Four volunteer fire brigades (Ebelsberg, Pichling, Pöstlingberg, St. Magdalena) and nine company fire brigades complement Linz' firemanship. Additionally, the national school of firemanship, which is subjected to the Upper Austrian fire-brigade federation, is located in Linz. In this school, all members of Upper Austrian fire brigades are being educated. A close up of the neogothic new cathedral. Part of main square with trinity column. The main street "Landstraße" leads from the "Blumauerplatz" to "Taubenmarkt" (Pigeonmarket) near the main square. The main square (built in 1230), with an area of 13,200 m², is one of the largest converted squares in Europe. 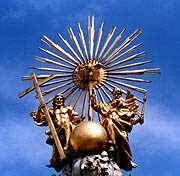 In the middle of the main square the high "Pestsäule" ("plague column", also known as "Dreifaltigkeitssäule" (Dreifaltigkeit means Holy Trinity)) was built to remember the people who died in the plague epidemics. Around the main square are many historically relevant and architecturally interesting houses, such as the Old Town Hall, the Feichtinger House with its famous carillon, which changes the melody depending on the season, the Kirchmayr House, the Schmidtberger House or the bridgehead buildings, which house a part of the Linz Art University. West of the main square there is the old quarter with many other historic buildings, such as Renaissance houses or older houses with a baroque face. Near the Schloss/castle, being the former residence of emperor Friedrich the III — the oldest Austrian church is located: Sankt/Saint Martins church. It was built during early medieval Carolingian times. St. Mary's Cathedral (Mariä-Empfängnis-Dom), Roman Catholic., in Gothic-Revival style. With a total height of 134,8 meters, the cathedral is the tallest church in Austria. Constructed in the years of 1862 and 1924, it is fully built of sandstone with unfinished front details. Mozarthaus is the house, dating to the end of the 16th century, where the famous Austrian composer Wolfgang Amadeus Mozart composed the "Linz" Symphony and "Linz" Sonata during a three-day stay there in November 1783. Today, the exterior and inner courtyard of the house can be visited, but not the interior. Pöstlingberg-Kirche: pilgrimage church on the Pöstlingberg hill. The basilica is the city's landmark and was built from 1738 until 1774, located on 537m sea level. Brucknerhaus: the concert and congress house located on the Donaulände was first opened in 1973 and is venue of the Brucknerfest since 1974. It is named after the composer Anton Bruckner, who was born in Ansfelden, a small town next to Linz. The modern Concert Hall owes its unique acoustics to its wood paneling. The Great Hall of the Bruckner House, also called Brucknersaal, is the architectural jewel hosting an organ consisting of more than 4,200 pipes and 51 registers. The spacious stage in particular was designed for 220 performers. In 2017 the life and works of Anton Bruckner were the focus of the Bruckner Festival held under the motto "Bruckner elementar". Bruckner's works were the focus of the festival presented by national and international artists. 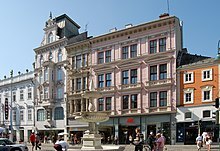 Kremsmünsterer Haus: is to find at the "Alter Markt", located in the inner city of Linz where, as legends say, emperor Friedrich III. had died. Landhaus: The country house was built in the 16th century and is the headquarters of the governor, the upper Austrian parliament and the government of upper Austria. Johannes Kepler used to teach here for more than 14 years. Other popular attractions include the museums listed below, as well as architecturally interesting and impressively illuminated in the evening (such as the Ars Electronica Center or the Lentos Art Museum), the Tobacco Factory, the Danube Lands, the port of Linz including Mural Harbor, the Voestalpine Stahlwelt or the District Urfahr. In the immediate vicinity is the Pöstlingberg, close to the baroque pilgrimage basilica, the Linz zoo, or the fairytale and dwarf kingdom of the Linzer Grottenbahn. The former townhouse of Kremsmünster Abbey. As many central European cities, the cityscape of Linz is characterised by small and several sacred buildings. The Mariä Empfängnis Dom or New Cathedral is the biggest church in Austria, not by height (it is roughly 2 metres shorter than the St. Stephen's Cathedral (Stephansdom) in Vienna), but by capacity. Amongst the newer buildings is the new Central Station, which was designed by Wilhelm Holzbauer and added the Terminal Tower skyscraper as part of a mixed-use complex. Between 2005 und 2011 it was voted Austria's most beautiful railway station seven times in a row by the Verkehrsclub Österreich. The Wissensturm ("Tower of knowledge") with a height of about 63 metres, houses the public library and the Volkshochschule, an adult education centre. It was designed by Franz Kneidinger and Heinz Stögmüller and opened in 2007. Lentos Art Museum, which opened in 2003, was designed by Zürich-based architects Weber & Hofer and the Musiktheater (music theatre), which opened in 2013, was designed by Terry Pawson. Linz has 13 cemeteries, four of them are supervises by the LINZ AG. The city is now home to a vibrant music and arts scene that is well-funded by the city and the state of Upper Austria. Between Lentos Art Museum and the "Brucknerhaus", is the "Donaulände", which is also referred to as "Kulturmeile" ("culture mile"). This is a park alongside the river, which is used mainly by young people to relax and meet in summer. It is also used for the Ars Electronica Festival in early September and the "Stream Festival", which takes place annually. In June, July and August the "Musikpavillon" is placed in the park where musical groups of different styles perform on Thursdays, Fridays, Saturdays and Sundays free of charge. The latest project developed by Linz in the context of the City of Media Arts project is the Valie Export Center, which is located in the Tabakfabrik (tobacco factory) and carried out in cooperation with the University of Art and Design Linz. It serves as an international research hub for media and performance art. Beyond that, it comprises the legacy as well as the archives of the most renowned media artist coming from Linz, Valie Export, who has received numerous national as well as international prizes. Along with the Ars Electronica archives, Linz hosts two internationally renowned archives for media art. These archives serve as a starting point for an artistic and a scientific interaction with media and performance art both in Austria and around the world. Since 2009, the Open Commons Linz initiative has made available a wide variety of "free" data: geo-data and statistical information having to do with city life, local government, recreation and tourism. An associated effort is the Hotspot initiative that has installed 202 hotspots providing free WLAN, as well as Public Server, the municipal cloud available to all citizens registered in Linz. Linz is thus at the forefront in Europe when it comes to universal access to open data. virtual world with wall and floor projections (each 16 by 9 meters), laser tracking and 3-D animations. City Museum Nordico houses an art collection as well as a historical and an archeological collection, all of which relate to the city of Linz. About 16,000 people visited the museum in 2013. Upper Austrian Regional Museum (Oberösterreichisches Landesmuseum) has three main locations that focus on different aspects of the regional history: The Landesgalerie (regional gallery) exhibits modern and contemporary art, the Schlossmuseum houses archeological findings all of which retrace Upper Austria's cultural history whereas the aim of the Biologiezentrum Linz-Dornach (centre of biology) is to retrace the region's natural history with an exhibition of about 16 million objects (which makes it the second biggest museum for natural history in Austria). Upper Austrian museum of literature (Oberösterrreischisches Literaturmuseum), the Adalbert Stifter Institute for literature and linguistics and the Upper Austrian house of literature (Oberösterreichisches Literaturhaus) all are situated in the StifterHaus, where Austrian writer, painter and educationalist Adalbert Stifter lived from 1848 to his death in 1868. Upper Austrian forum for architecture (Architekturforum Oberösterreich) in the house of architecture (Haus der Architektur) attracts about 6,000 visitors annually. The forum organises lectures, exhibitions, conferences and competitions. Upper Austrian open house of culture (Offenes Kulturhaus Oberösterreich, acronym: OK) is an art institution focusing on contemporary art. Museum of Dentistry (Zahnmuseum) shows an exhibition of equipment used in dentistry from the early 18th century to the recent past. Cowboy-Museum Fatsy presents cowboy culture, showing original pieces from the United States. The Stadtwerkstatt is an independent association for culture and was founded in 1979. Its headquarters is located in the Urfahr district on the north bank of the Danube close to the Ars Electronica Centre and serves as venue for music events and other artistic and cultural activities. Situated at the same address is the Stadtwerkstatt's own Café Strom, a café/bar popular amongst young adults. Wolfgang Amadeus Mozart wrote his Symphony No. 36 (1783) in Linz for a concert to be given there, and the work is known today as the Linz Symphony. He reportedly also composed his Piano Sonata 13 in B flat while in Linz, although it was published in Vienna. Anton Bruckner was born in Ansfelden near Linz and spent several years working as a conductor and organist in Linz, where he also started to compose. The first version of Bruckner's Symphony No. 1 in C minor is known as the Linz version. The Brucknerhaus, a concert hall in Linz as well as its annual international Brucknerfest are named after him. The history of cinema and film begins in Linz in September 1896, when, as part of a variety programme, a film programme was shown in "Roithner's vaudeville" for the first time in Upper Austria. Until the next screening of a film it took until 20 March 1897, when Johann Bläser's travelling cinema guested in the "Hotel of the Golden Ship". Until the opening of the first cinemas with regular programme, it took till the end of the year 1908. At that time, Karl Lifka opened his "Lifka's Grand Théâtre électrique" in that building, where already the very first film showing took place. Subsequently, the second cinema of Linz was opened a few months later. As the owner of travelling cinemas, Johann Bläser, got settled in Linz, he bought the "Hotel of the Golden Ship", and installed a cinema in it, the "Bio-Kinematograph". The third stationary cinema, called "Kino Kolloseum", in town was founded around 1910 by the vaudeville operator Karl Roithner. Its first location was the former festival hall at Hessenplatz. The Linz International Short Film Festival is the first film festival in Upper Austria to focus on international short films. It launched in October 2018 at the Moviemento in Linz, showing 114 films over four days. The concept goes back to the festival director Parisa Ghasemi. In September 2007 the "Wissensturm", next to the central station, was completed. There the Main Library and the adult education centre are housed. In the same year the expansion of the National Library on Schillerplatz began. The Main Library is the largest public library in Upper Austria. The library has a stock of 220,000 media, of which approximately 60,000 audiovisual media, as well as numerous magazines. The library also offers public Internet access and computers for surfing. The public library focuses on supporting reading. Thus in addition, regularly events such as readings, workshops or reading consultations take place. In Linz there are both traditional restaurants and old wine taverns, as well as modern and exotic cuisine. The influence of 140 nations can be felt in Linz's culinary offerings. A coalition of over 40 restaurants, cafes and among other locations bars are called "hotspots". Moreover, Linz has several à la carte restaurants and Gault Millau gourmet restaurants. Ars Electronica Festival: the Ars Electronica Festival is a festival for media art which has been taking place annually in Linz since 1986 and includes exhibitions, concerts, performances, symposia and interventions on changing themes that take place in public settings such as churches and industrial halls. The events focus on art, technology and society and the nexus among them. In 2015 about 92,000 visitors attended the Ars Electronica Festival. The topic in 2016 was "RADICAL ATOMS and the alchemists of our time". In 2017 the festival took place under the theme "Artificial Intelligence – The Alter Ego". The festival takes place in different public spaces and is considered to be a confrontation with and in the public sphere. Black Humour Festival: Every two years in May, the Festival of Black Humour with guests from all over Europe takes place in the Posthof in Linz. The latest festival was in May, 2017 (04.-24.May) representing performances from Italy, Sweden, Germany and Spain. Donau in Flammen (Danube in Flames): Annual music fireworks from June to August in Upper Austria on the banks of the Danube, accompanied by a broad supporting program. Höhenrausch: Höhenrausch is an annual art project that was developed in 2009. As part of the DonauArt, an inter-institutional cultural project, Höhenrausch 2018 is under the motto "The other shore". The element of water is worked on by international artists, with the definition of the shore being the focus of artistic exploration. Diverse spaces and places underline the presentation of this project. 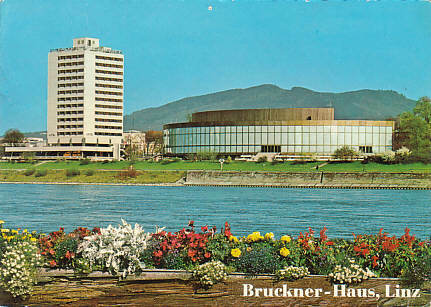 International Brucknerfest: Following the opening of the "Brucknerhaus" concert hall in Linz three years earlier, the international Brucknerfest took place for the first time in 1977. Whereas the first two editions were only dedicated to classical music in general and Anton Bruckner's pieces in particular, this changed in 1979 when the international Brucknerfest, the Ars Electronica festival and the "Klangwolke" (sound cloud), which now marks the beginning of the Brucknerfest, were merged to create a festival worthy of competing with those in Vienna and Salzburg. Taking place annually for three weeks in September/October it closes the Austrian festival season. Kinderfilmfestival (Kid's Film Festival): The international children's film festival is organized by the Kinderfreunde Oberösterreich. Films are shown in the original version while being live synchronised by an actor. The 29th festival will supposedly take place in November 2017. Kinderkulturwoche (Children's Week of Culture): The children's culture week has been taking place regularly since 2013 with plays, workshops, intro courses for children and teenagers. Donaupark Linz: contains sculptures by national and international artists such as Herbert Bayer, Max Bill and David Rabinowitch. The original idea of this project, called 'forum metall', by Helmuth Gsöllpointner and Peter Baum, was to set an example of Linz as an art metropolis with sculptures symbolizing a fusion of art and economy. Mural Harbor: The main focus of the Mural Harbor Cultural Association are graffiti and contemporary wall paintings. The aim of the association is to enrich the harbour environment with colors and codes of our generation as symbols and traces of today's time. Above all the mood of every city dweller should get brightened up as the paintings beautify everyday life. Local and international artists from Germany, Serbia, Greece, Spain, Brazil, Venezuela, USA or Australia have participated in this project. There are tours that offer to get closer to the graffiti art by river cruise. At the end of each tour you get the chance to attend a graffiti workshop. Tabakfabrik: location for exhibitions and musical events. For about four decades Gerhard Haderer, a cartoonist from Linz, has been criticizing and unmasking the obedient ones in our society. His most recent project titled "Schule des Ungehorsams" ("School of Disobedience") is an appeal to all the people interfering in order to contribute to shaping our society which makes us ponder on disobedience in a playful way. It will be hosted in the Tabakfabrik (tobacco factory) in Linz and Haderer himself will be the janitor. The planned activities will include exhibitions, public readings, publications, lectures and workshops. The project "Linz 1938/1918", which started in June 29, 2018, commemorates the 100th anniversary of the founding of the Republic (1918) and 80 years of "political union" (1938). With this installation in the public space, presented in the city center, Linz fulfills its responsibility and commitment to maintaining peace with its declaration, making a contribution to dealing with the past. The idea is to reach people who have little relation to the years of 1918 or 1938. The Johannes Kepler University Linz is situated in the north-east of Linz, and hosts law, business, social sciences, engineering and science faculties; about 19,170 students (2016/2017) are enrolled. A spin-off of the university, as well as a Fachhochschule for various computer-related studies, (polytechnic) is located 20 miles (32 km) north of Linz in the small town of Hagenberg im Mühlkreis. Among Linz's grammar schools is Linz International School Auhof (LISA), it is one of four IB (International Baccalaureate) schools in Austria. At the school, English is the main language for instruction. A sculpture at the Bauernberg park. Linz offers many parks and holiday areas: Lakes and public swimming pools: Pichlinger See, Pleschinger See, Weikerlsee, Biesenfeldbad, Hummelhofbad, Parkbad, Schörgenhubbad. One of the first public swimming pools was the former "Fabriksarm", a Danube branch stream (from Parkbad to Winterhafen) that was filled up in 1890. Afterwards a makeshift at the "Obere Donaulände" was built, which existed until a flood in 1954. In 1901 the "Städtische Schwimmschule" (city swimming school) was built at the place of the former Parkbad. Botanischer Garten: About 100,000 visitors are attracted by Botanischer Garten, which makes it one of the most visited sights of the city since 1952. Situated at Bauernberg, and comprising 4.2 hectares, the arrangement distinguishes by its harmonious design, its abundance of plant species (about 8,000 different types in culture) and the multifaceted cultural and event programme. Freinberg: public park, very well frequented by families and joggers. One of the most beautiful residential districts of Linz. Wasserwald: Big Park (approximately 1 km²) in the south of Linz. The park is located in the district of Kleinmünchen, where large waterworks are situated. The most frequent visitors are walkers, joggers, Nordic walkers and dog owners, who enjoy the idyllic atmosphere of the park. The park is equipped with well-maintained sidewalks, playgrounds, two toboggan hills, a fitness trail, a running track and a senior park with chess. Furthermore, two public toilets are available. Stadtpark: On 22 August 2003, the new Linz City Park between Huemer-, Museum-, Noßberger- and Körnerstraße was officially opened. With 10,807 square metres of green area, it is the second largest inner-city park. The city of Linz has acquired this area due to a barter with the Austrian postal service. Since Schiller Park in 1909, there has been no newly openend park of this magnitude in the centre of Linz. Linzer Zoo: Linz Zoo is located at Pöstlingsberg and is home to around 600 animals from 110 different species on 4 acres (2 ha). In recent years, the zoo was able to increase its visitor numbers continuously. In 2014, about 132,000 visitors visited Linz Zoo. Kirchschlag ski resort is located 15 km north of Linz and has three ski lifts: The Hauslift, the Waldlift or the Babylift. The special features of the ski area include the "How fast am I - route" which automatically measures the time or the night skiing. The ski area also has a 2 km long cross-country ski run, a curling ground and a nature ice rink. Especially in densely built-up inner-city areas smaller parks are highly important for the inhabitants of Linz, the parks act as green oases. Along the main axis of the city centre of Linz, the highway, several such small gardens are located. These are on the one handside the Landhaus Park, which has been redesigned as part of an underground car park construction until 2009, whereby the old trees have been preserved. 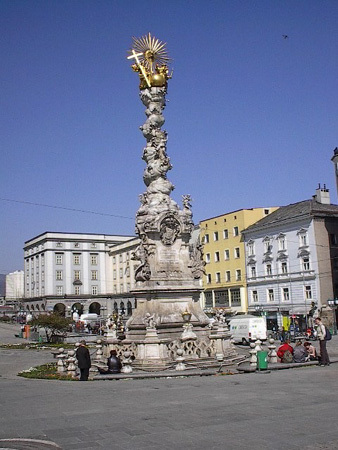 In addition, Hessenplatz or – park is located in the city centre of Linz. Hessenplatz was the centre of Neustadtviertel in 1884. Just off the highway Schiller Park is located, which replaced the Trainkaserne in 1909, and the Volksgarten, which was created in 1829 by an entrepreneur and bought up in 1857 by the city. The Donausteig is a non Alpine Austrian-Bavarian long-distance hiking trail, which is 450 kilometres (280 miles) long and is divided into 23 stages. Since the summer of 2010 it mainly leads alongside both banks of the Danube, from Passau through Linz and St. Nikola to Grein. The trail mainly runs through nature and leads to popular landscapes and viewpoints. From the end of April until the beginning of October the Design-Ship "MS Linzerin" offers a harbor tour of 100 Minutes – three times a day (Tuesday until Sunday). 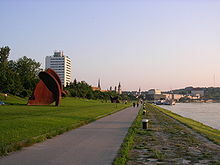 Starting point of the tour is the Linzer Donaupark and the tour goes along the Linzer Kulturmeile, passes the Brucknerhaus and ends at the waterfront mouth of ÖSWAG Schiffswerft Linz. Linz is in the urban forest area ranking in front of Graz, even if only 500 hectares are owned by the city itself. These are sustainably managed and maintained, with 87 hectares of usable, 46 hectares of protection, 30 hectares of recreational and 353 hectares of welfare function. The latter represents the main function of the Linzer Wald. 18 percent of the city, which covers a total of 96 square kilometers, is forested and occupies up to 1,724 hectares of forest, 74 hectares more than in 2004. This is the reason why it is called Stadt-Wald, city-forest. There are 302 Sport Clubs in Linz. 224 of those are a part of the three major umbrella organizations ASKÖ (108 Clubs with about 48,500 members), UNION (67 clubs with about 40,500 members) and ASVÖ (49 clubs with about 19,000 members). One of the more well-known clubs is "LASK" – they moved to Paschinger Waldstadion in the meantime – as well as "SK VÖEST Linz" – now called "FC Blau- Weiß Linz". Furthermore, the popularity of the ice hockey club "EHC Black Wings Linz" has increased, in particular after they won the championship in the seasons 2002/03 and 2011/12. A detailed view of the monument for Adalbert Stifter at Promenade. ^ a b "LINZ - UNESCO City of Media Arts" (in German). Retrieved 10 January 2015. ^ Paul Hofmann (5 April 1987). "Letting Linz Castle cast a spell". The New York Times. Retrieved 2 December 2008. ^ Lundy, Darryl. "A genealogical survey of the peerage of Britain as well as the royal families of Europe". The Peerage. Retrieved 15 April 2008. ^ Samuel W. Mitcham (2007). Eagles of the Third Reich. Stackpole. p. 261. ISBN 9780811734059. Retrieved 27 September 2015. ^ "Linz in Zahlen". Stadt Linz. Retrieved 30 March 2015. ^ "Klimadaten von Österreich 1971-2000 -Linz" (in German). Central Institute for Meteorology and Geodynamics. Retrieved 6 September 2012. ^ "LINZ AUCH IM KONGRESSBEREICH AUF ÜBERHOLSPUR" (in German). Archived from the original on 5 July 2015. Retrieved 29 January 2015. ^ "Tagungshandbuch 2014 web" (in German). Retrieved 29 January 2015. ^ "VCÖ Bahntest 2014" (in German). ^ Linz Linien GmbH for Local Transport. Linz AG. Retrieved 29 August 2010. ^ "St. Martin's Church, Linz (in English)". Linz City Tourist Board. Retrieved 6 April 2008. 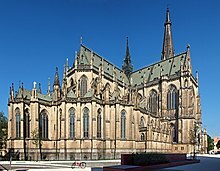 ^ "Mariendom (New Cathedral in Linz)". Mariendom. Archived from the original on 28 January 2010. Retrieved 6 April 2008. ^ "Great Hall". Retrieved 29 January 2018. ^ "PK Internationales Brucknerfest 2017" (in German). Archived from the original on 6 August 2017. Retrieved 29 January 2018. ^ "LASK". LASK. Archived from the original on 9 April 2008. Retrieved 6 April 2008. ^ George Tabori. "Mein Kampf: Farce in fünf Akten" (in German). Landestheater. Retrieved 6 April 2008. ^ "Die Spielzeit 2007/2008". Landestheater. Retrieved 6 April 2008. ^ "Denkmäler" (in German). Retrieved 20 July 2016. ^ "Welcome Posthof 04 2008". Posthof. Retrieved 6 April 2008. ^ "Stadtwerkstadt". Stadtwerkstadt. Retrieved 6 April 2008. ^ "Pflasterspektakel Festival". Magistrat der Landeshauptstadt Linz. Archived from the original on 8 August 2010. Retrieved 24 July 2010. ^ "European Capital of Culture". Linz Tourist Board. Archived from the original on 3 April 2008. Retrieved 6 April 2008. ^ "Creative Cities Network". Retrieved 20 January 2015. ^ "UNESCO Creative Cities Beijing Summit". Retrieved 30 June 2015. ^ "Linz, UNESCO City of Media Arts". Retrieved 30 June 2015. ^ "Valie Export Center in der Tabakfabrik". Retrieved 29 January 2018. ^ "Linz & Media Arts". Retrieved 29 January 2018. ^ "Open Commons Linz". Retrieved 26 May 2017. ^ "Biologiezentrum Linz – größte naturkundliche Sammlung des Landes Oberösterreich" (in German). Archived from the original on 25 October 2014. Retrieved 4 November 2014. ^ "Musikpavillon im Donaupark, Nähe Brucknerhaus" (in German). Retrieved 25 September 2014. ^ "Das Musiktheater am Volksgarten-Linz hat ein neues kulturelles Wahrzeichen" (in German). Retrieved 27 August 2014. ^ "About". Retrieved 27 August 2014. ^ "Posthof" (in German). Retrieved 27 August 2014. ^ "Chronologie" (in German). Retrieved 27 August 2014. ^ "Linz International Short Film Festival Presse" (in German). Retrieved 27 November 2018. ^ "2013 mehr als eine Million Entlehnungen in der Stadtbibliothek" (in German). Retrieved 19 July 2016. ^ "Stadtbibliothek Linz" (in German). Retrieved 19 July 2016. ^ "Linzer Gastronomie" (in German). Retrieved 20 July 2016. ^ "Ars Electronica Festival 2015". Retrieved 29 January 2018. ^ "2016 Ars Electronica Festival at the PostCity". Retrieved 29 January 2018. ^ "Fallout Shelter, Conveyer Belts, Spiral Packet Chutes and Lots of Media Art: Highlights of the 2017 Ars Electronica Festival in POSTCITY". Retrieved 29 January 2018. ^ "Ars Electronica Festival – About". Retrieved 25 September 2014. ^ "Black Humour Festival". Retrieved 15 September 2017. ^ "Bubble Days – das etwas andere Linzer Hafenfest" (in German). Retrieved 4 November 2014. ^ "CROSSING EUROPE Festival History 2004-2014". Retrieved 25 September 2014. ^ "Das sagenhafte Musikfeuerwerk auf der Donau". Retrieved 15 September 2017. ^ "THE FESTIVAL OF REGIONS". Archived from the original on 5 November 2014. Retrieved 4 November 2014. ^ "Höhenrausch 2018". Retrieved 10 October 2018. ^ "Brucknerfest – The Idea". Archived from the original on 13 January 2015. Retrieved 25 September 2014. ^ "Festivals in Linz – Brucknerfest Linz" (in German). Retrieved 25 September 2014. ^ "Willkommen beim Internationalen Kinderfilmfestival!". Archived from the original on 16 September 2017. Retrieved 15 September 2017. ^ "Kinderkulturwoche Linz 2017". Retrieved 15 September 2017. ^ "Mission Statement" (in German). Retrieved 4 November 2014. ^ "Der 12. Borealis Linz Donau Marathon sprengt alle Teilnehmerrekorde" (in German). Retrieved 4 November 2014. ^ "Pflasterspektakel 2014". Archived from the original on 18 October 2014. Retrieved 25 September 2014. ^ "Projects" (in German). Retrieved 10 October 2018. ^ "Haderers "Schule des Ungehorsams" eröffnet" (in German). Retrieved 29 January 2018. ^ "Gedenkjahr 2018". Retrieved 25 July 2018. ^ "Kirchschlag bei Linz - Schilifte Kirchschlag GmbH" (in German). Archived from the original on 26 April 2015. Retrieved 28 April 2014. ^ "Linzer Stadt-Wald" (in German). Retrieved 1 August 2018. ^ "Doug Hammond biog". Doug Hammond. Retrieved 6 April 2008. ^ "Andrew Edge". Andrew Edge. Retrieved 6 April 2008. ^ "Sister Cities of Linz". Retrieved 27 October 2011. ^ Міста-побратими м. Запоріжжя [Twin Cities Zaporozhye]. City of Zaporizhia (in Ukrainian). Шановні відвідувачі і користувачі сайту. Archived from the original on 21 July 2011. Retrieved 7 August 2013. Wikimedia Commons has media related to Linz. Wikisource has the text of the 1921 Collier's Encyclopedia article Linz. "Linz" . New International Encyclopedia. 1905. This page was last edited on 25 April 2019, at 08:37 (UTC).